Pristine Sea I is a natural, non-toxic, non-hazardous clay sorbent specifically designed for quick response to oil spills associated with offshore platforms, pipelines, terminals, ports, and harbors. 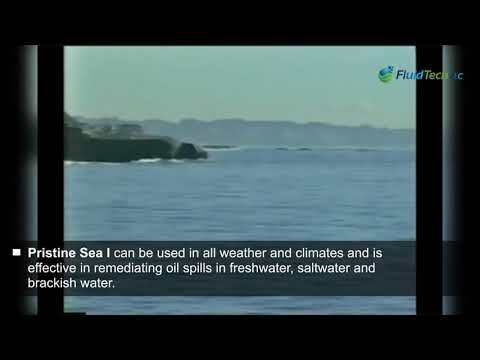 Pristine Sea I can be used in all weather and climates and is effective in remediating oil spills in freshwater, saltwater and brackish water. Section 300.915(g)(1) of the National Contingency Plan. Pristine Sea I uses amine-substituted water-swelling clays that chemically attach to fresh and weathered oil spills to form a semi-solid “cake” within hours of application. 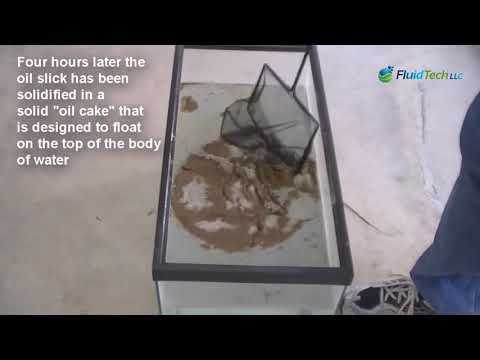 The resulting oil cakes are less dense than water, are cohesive enough and possess enough mechanical strength that they can be skimmed from the top of the water for reclamation. The bonding mechanism between Pristine Sea I and oil is irreversible. Pristine Sea I has proved effective on Louisiana Sweet, Alaskan North Slope, North Sea Brent, and aged Kuwaiti crude as well as light and heavy refined oils. Pristine Sea I is designed to float on top of the water after it has chemically attached to the oil allowing for easy reclamation without also collecting and treating large volumes of water. Pristine Sea I sets very quickly (usually in less than 4 hours) and will remain in a solid state indefinitely. The combination of fast-setting and long-lasting allows for a more efficient collection operation. Oil captured by Pristine Sea I will not desorb. The bonding mechanism between Pristine Sea I and oil is irreversible, ensuring that the absorbed oil will not leach back into the water column or form oil slicks. Pristine Sea I can "herd" oil spills into small islands of oil, quickly creating large openings of clear water that allow sunlight to pass which is crucial for many water-based life forms and flora. Herding will occur naturally through the agitation caused by wave action. If Pristine Sea I clumps do land on shores or beaches, they can be cleaned by mechanical means such as sifting, raking or screening. The issue becomes one of separating one solid from another rather than the much more cumbersome and expensive task of separating liquid oil from a solid. Due to the high BTU content of the oil solidified with Pristine Sea I, the energy from the solidified oil can be recovered for use. Pristine Sea I is usually sprayed on an oil spill in dry particle form using hand-held or ship mounted blowers. Pristine Sea I can also be mixed with water to enable it to be dispersed by ship-mounted spray guns. Pristine Sea can be applied by airplane in a fashion similar to crop dusting or via helicopters in a manner similar to forest fire fighting applications. The application of Pristine Sea I by aircraft and surface vessels requires minimal personnel making it ideal for shallow waters or remote areas where mechanical recovery and cleanup crews cannot be deployed. When Pristine Sea is applied to an oil spill, it forms semi-solid clumps of solidified oil that can be mechanically collected without also collecting and treating large volumes of water. Oil solidified with Pristine Sea I can be collected in a variety of methods including fishing nets, floating fences, paddle collectors, etc. allowing the cleanup vessel to only take solidified oil onboard, not water. Unlike Pristine Sea I, most physical removal methods require ideal weather, water turbulence and response time conditions. Detergents are usually toxic and can cause more damage to aquatic life than the oil itself. Pristine Sea I is non-toxic and non-hazardous to marine life and the environment. While most clays will remove oil from the surface, they can sink below the water to coat the bottom which is harmful to many forms of marine life. Pristine Sea I allows the solidified oil to float for easy reclamation. Many alternative technologies require an almost immediate collection of clumps before the oil either sinks or break up again allowing the oil to desorb back into the water or affected shore. Oil captured by Pristine Sea I will not desorb. United States Coast Guard approval for use in the Deepwater Horizon Response under Broad Agency Announcement HSCG32-10-R-R00019. Approved for use by British Petroleum's Alternative Response Technologies Team in the Deepwater Horizon oil spill response. Marine Institute of Finland field tests, evaluation, and approval for use in the Barents Sea. Philippines Cost Guard approval, Accreditation Certificate PCG-00-005. Pristine Sea I is non-toxic and non-hazardous. Its ability to bond with oil and not desorb (leach) back into the water protects marine life and prevents oil from washing into bayous, marshes, beaches, and shorelines. Pristine Sea I can quickly “herd” oil into clustered clumps creating areas of open, clean water surface and allowing the penetration of sunlight that is essential to many marine species. The solidified oil cakes will float and remain intact in a variety of temperatures and water conditions ensuring complete reclamation. Pristine Sea I is 100% made in the USA. 50 lb. bag of PRISTINE SEA I.
Pallet (42 x 50 lb. bags) of PRISTINE SEA I.